Marian Hazzard thinks that every school should fit a garden into its landscape somehow, even if it’s just in a couple of buckets. 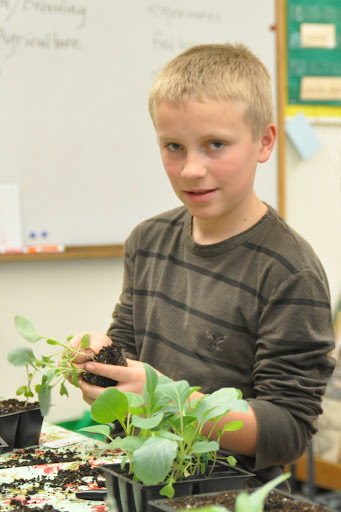 Every child should have the enlightening and empowering experience of producing food. As one of Touchstone’s founding parents, teachers, and guardian angels, Marian always put her heart and soul into nurturing the school. She taught reading and writing and math, along with interdisciplinary approaches to science and social studies, in classes of her own. She gave special effort to helping groups of students become communities of learners. Meanwhile, Marian also spent many hours of every week back at Touchstone, and could be seen at any hour of the day, often grubby and muddy and wearing a trademark straw hat, gardening herself, working with groups of students, and helping other adults learn how to work with gardens and kids, in the fullest and richest ways possible. A garden gives so much to a school. Growing beings, every one of us, we nonetheless don’t necessarily expect to be interested in the growth of plants from stage to stage—but almost every student is captured by the actual phenomena. 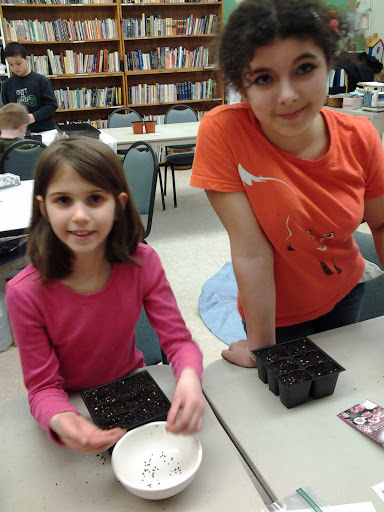 Here, older and younger kids work together to plant seeds that will germinate and sprout under grow lights in the classrooms. Translate that into: right under the kids’ noses; cheered on by kids’ voices; handy to be measured or sketched. 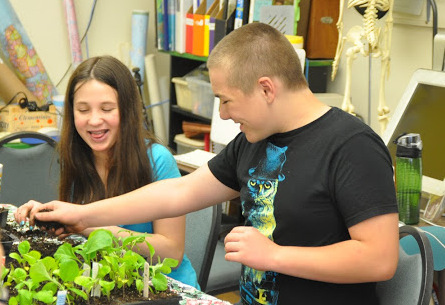 Here, a student transplants a seedling into a larger container, to sell at the school’s very own Farmer’s Market, which did a land-office business on a table off to the side at dismissal. 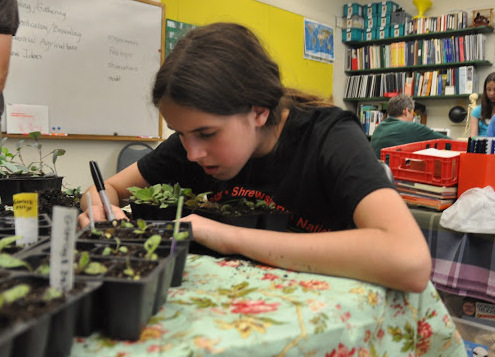 Below, another student writes a careful label for her tray of plants. The labels were cut-up strips of plastic yogurt containers. 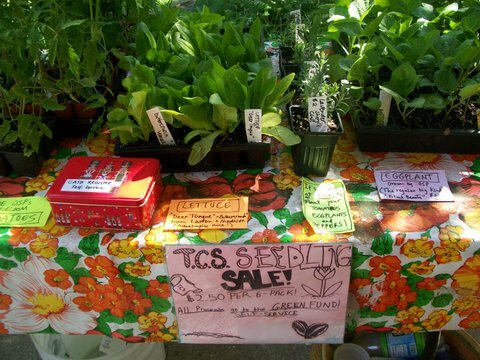 Marian encouraged not just a school garden, but a sustainable, green school. 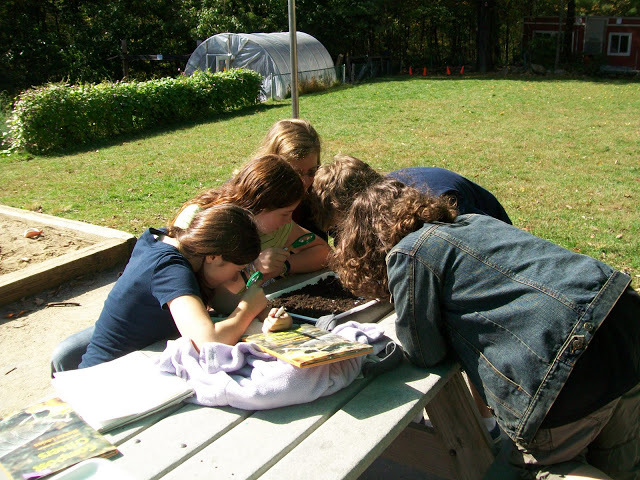 Of course, group work on garden tasks builds more than the garden. It nurtures social and emotional connection, building community. 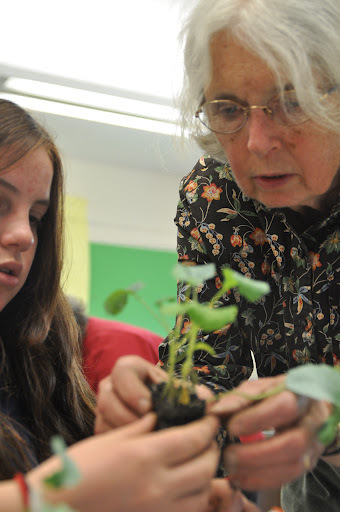 A garden teaches kids about life cycles, and that counts, always, as both science and emotional education. 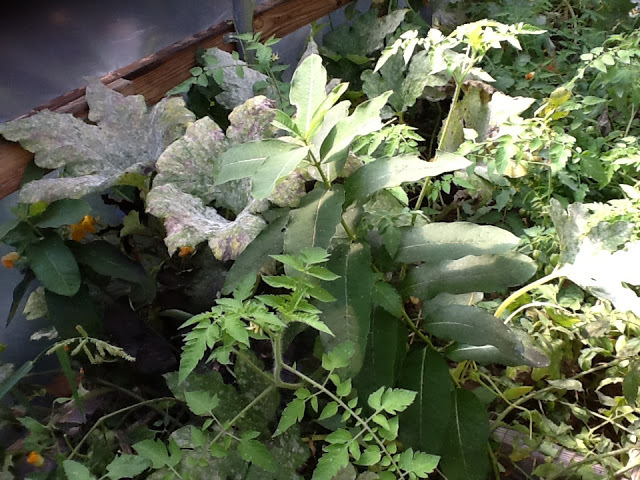 In this photo, taken in the greenhouse by students combing the campus for evidence of change, some plants are flowering while others are dying. Many years, some of the garden’s plants were grown from seeds produced by plants allowed to go to seed the previous year. Through all this, kids and adults both, we observe food webs and nutrient cycles, both like and unlike the ones the adults memorized in high school biology. 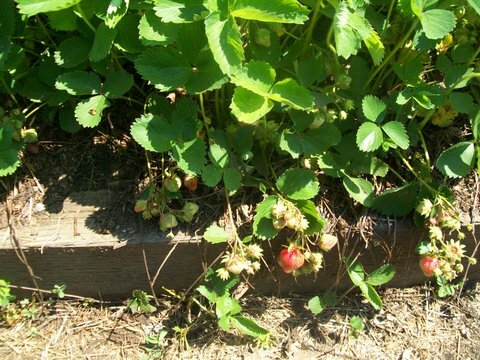 Sunshine helps strawberries ripen. Teachers and older kids help younger kids figure out how to share the strawberries. Strawberries too squoogey for human eating become wonderful treats for the chickens, who produce fresh eggs, which are a revelation for anyone who’s only known store-bought eggs. In another example, it’s easy to observe how much living things need water, a lesson likely to have life-and-death importance in the times in which these students will live. Here, you can see a watering can for the strawberries in the background, and a water dispenser for the chickens. 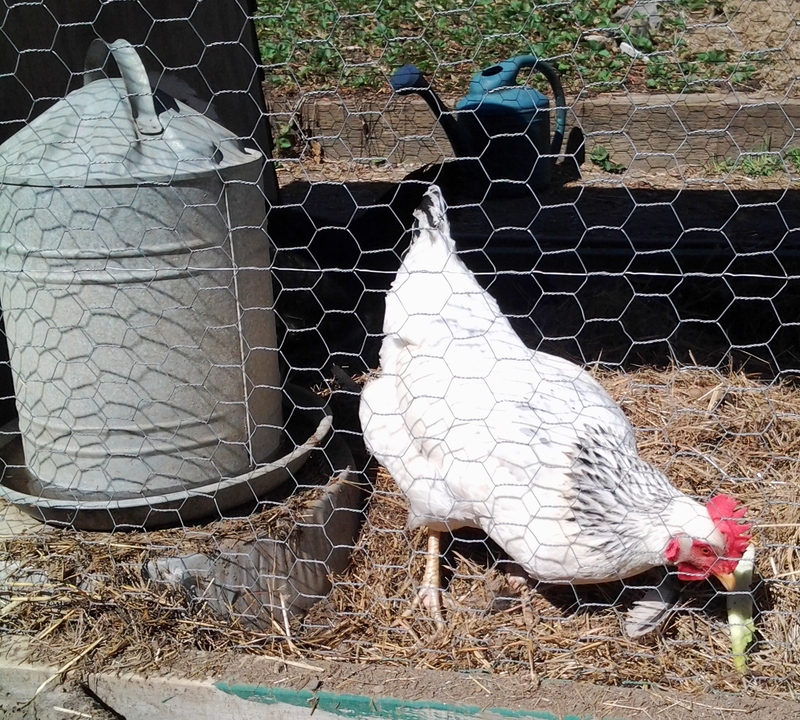 This chicken feasts on plant scraps pushed through the chicken wire by kids at recess. 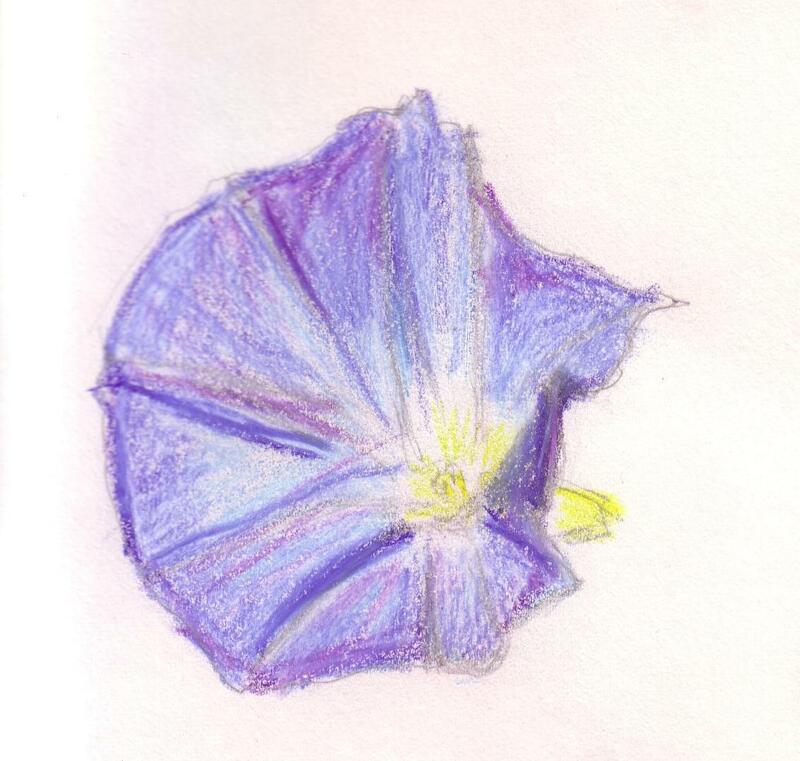 I loved also the plants nobody would ever eat, and spent many recesses standing by the morning glories along the fence, sneaking peeks into the universe of each flower. I wish I had more photographs of what we harvested, which often disappeared quickly: salads, potatoes, cherry tomatoes. Real food. I hope that someone who reads this will have (and post, in a comment) a photograph of Marian’s amazing car, embellished by colorful graphics of carrots and beets and garden invertebrates, a rolling advertisement for vegetable glory. Marian has a wonderful laugh and smiles often, but she is deeply serious when she says, “The world is changing, and these kids may well need to know how to grow their own food.” We all need to know how to take care in these ways; how to harness various kinds of natural magic in real and practical strategies that could mean survival. For everything she gave to the garden, Marian had a small supply budget, some years, and several gifts from particular grateful parents, to do things like build new beds and erect a greenhouse. Her own work she donated, as a volunteer. I’m putting that in the past tense, because Marian has stepped back, after recruiting a garden teacher–and raising the money to pay his stipend. I know you’re still there, Marian, in the background, offering advice and support. 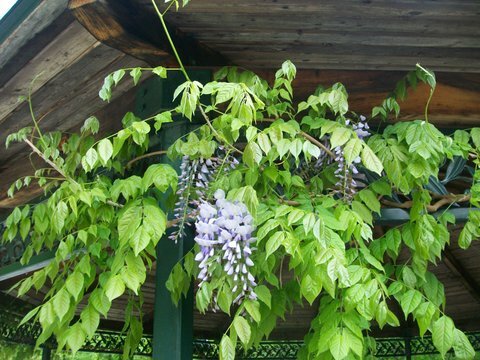 Here, in November, as the days suddenly shorten, I want to send you my thanks in the form of flowers, wisteria climbing on the school gazebo. May the Touchstone garden, and you, Marian, and everyone whose sense of the world you’ve greened, continue to thrive and grow. 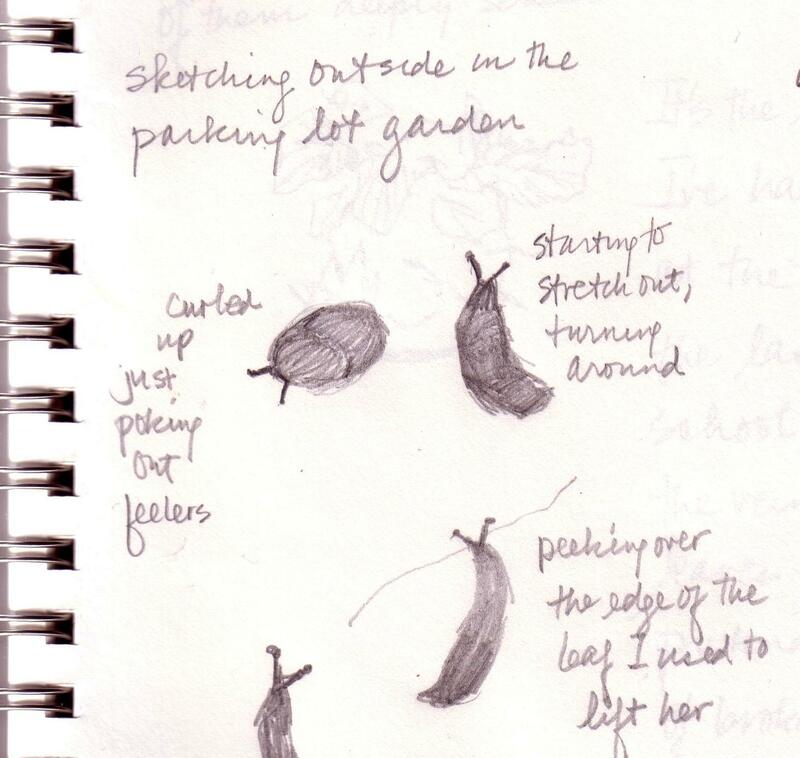 This entry was posted in Class life, Fieldwork, Integrating the arts, Place-based education, Science and tagged agriculture in the classroom, Compost Critters, gardening with children, growing food, Marian Hazzard, Massachusetts Agriculture in the Classroom, school gardens, sketching in the garden by pollybrown2013. Bookmark the permalink. Here, here! To Marian and to this wonderfully written blog about her! Ah! somehow I knew Marian would never leave…..To Marian my mentor…kudos!. So happy she has found yet another passion to share with Touchstone students.